Playback singer in Hindi cinema who sang over 1,200 songs, like "Woh Sapne Waali Raat." 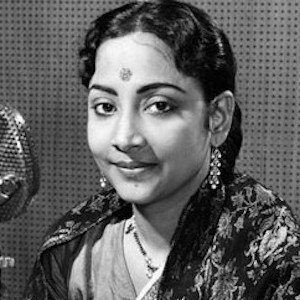 Her big break came in 1946 when she sang in the fantasy film Bhakta Prahlad. She suffered a nervous breakdown and had serious financial problems after the death of her director husband. She was one of ten children born to Debendranath Ghosh Roy Chowdhary and Amiya Devi. She collaborated with director Guru Dutt, who was also her husband until his death in 1964.